Cobber alum Wyatt Steinke is Concordia’s new Manager of Choral Activities. ANNA KNUTSON. Wyatt Steinke went from the practice rooms and rehearsal halls of Hvidsten Hall of Music to his own office as the new Manager of Choral Activities here at Concordia. Steinke graduated in 2017 as a vocal music education major. While he was a student, he was very involved in the choral program. He was the student manager of an all underclassmen male choir, Männerchor his first year and the student manager of the Concordia Choir his Junior and Senior year. “I really enjoyed the behind-the-scenes part of choir,” Steinke said. While working as a student manager, Steinke said he loved being a leader of the logistical side of the ensemble, like concert stage set up and facilitating the annual Concordia Choir tour. Steinke’s leadership roles propelled him forward after graduation. He was hired for his first teaching job in Park Rapids, Minn., as the 9-12 choir director at the high school. “My plan since high school had been to be a high school choir teacher. Park Rapids has a great choral program and I was lucky enough to be doing exactly what I wanted to do,” he said. After a year of teaching, Steinke found out that the Manager of Choral Activities position at Concordia was available from René Clausen, director of the Concordia Choir. Even though this job was never in Steinke’s plan, after thinking about how much he missed Concordia’s choral program and talking to his fiancee, who is also an alum of Concordia, about it they both knew he had to jump at the opportunity. After making the difficult decision to leave his teaching career, Steinke applied and got the job. As the manager of choral activities, Steinke works behind the scenes of all the choirs to make sure they can focus solely on making music. He plans the Concordia Choir and Chapel Choir tours, produces the Christmas Concert, updates online content and much more. “I do just about everything but the music,” Steinke said. He is looking forward to planning the events that were once his favorite parts of being at Concordia, especially the Concordia Choir tour. Clausen is looking forward to working with Steinke for tour as well as seeing how the year develops with him as the new manager. “We are really fortunate to have him here. I feel really comfortable and that we are not missing a beat,” Clausen said. As for new ideas for the school year, Steinke is planning to expand his role into student-led vocal ensembles. As a former member of several student-led ensembles, he remembers the struggles of trying to organize performances, which is a big part of why he wants to help. 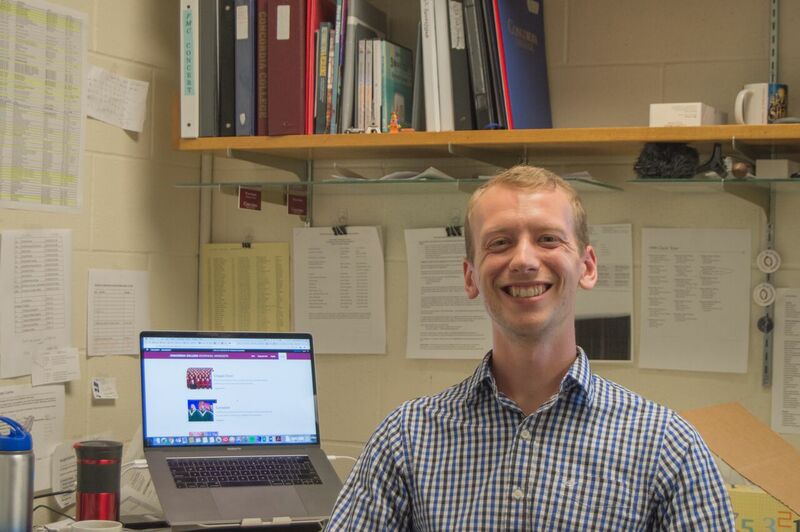 Overall, Steinke is optimistic about his first year as a staff member and loves being back at Concordia, a special place he gets to call home once again.